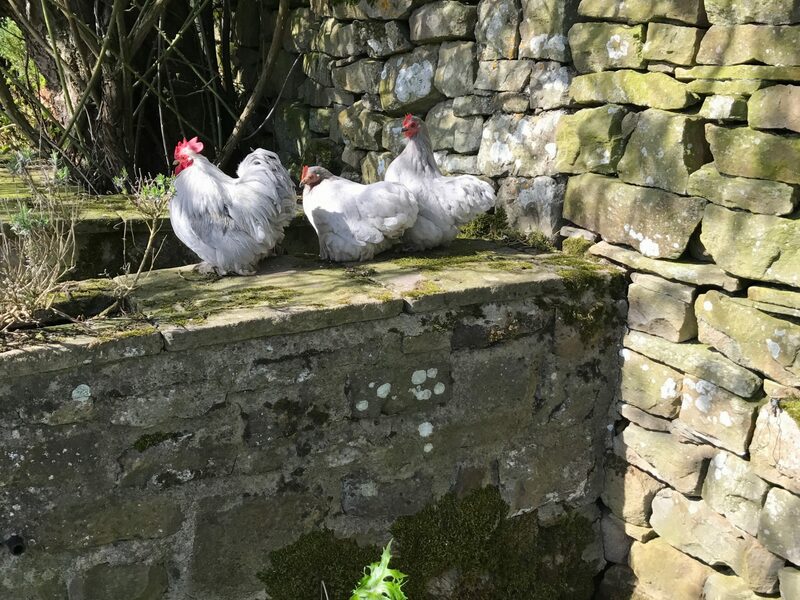 Spring has sprung, Easter is almost here and AC director of food, Rolline Frewen has kindly penned this blog about scrambled eggs, hens and her life in the Yorkshire dales. I love watching the changing seasons; the different colours, light, birds and plants, but spring has to be the most exciting with so much to look forward to. One has to laugh at the extraordinary weather we have at this time of year. During the last week of March, we woke to 6″ of snow, then 3 days later, I had to change into a short-sleeved shirt as I got too hot pottering around the veg patch. At this time of year, egg production always speeds up and our hens are particularly happy now they are out of ‘Colditz’, aka the dog kennels. Having spent the last 2.5 months behind bars due to the avian flu problem. They have now been allowed back into ‘Chickenham Palace’, their proper home at the top of the orchard. Having got used to my husband Robert switching on their light in the kennels early each morning and off again late at night, they thought it was summertime and with so much light they laid eggs as if it was summer. This was great because we had lots and lots of lovely eggs, but as soon as they were back in their proper hen house, that all stopped. This morning was a treat. Was it to do with the clocks going forward or are the hens just getting used to being back in their proper home? Whatever the reason, I collected a good clutch of eggs, so egg dishes are certainly on the menu. With so many eggs I have fun concocting lots of different dishes. I have a bit of a reputation for cheese soufflé; it’s a great way of using up both eggs and leftover bits of cheese, but the easiest, real fast food has to be scrambled eggs. So many cuisines around the world make scrambled eggs, but with their own touch and eat them at any time of day. I particularly enjoy really spicy Moroccan eggs as a late night snack. Our staff are from many countries around the world, and they have provided inspiration for some of these variations. Try any of these combos for the fastest feast in the west. Enjoy experimenting and please do let us know if you try any of these variations. All that remains is to wish everyone a very Happy Easter from the whole AC team and remember if you would like to speak to our team about menu ideas for your own party, do contact us for a chat.